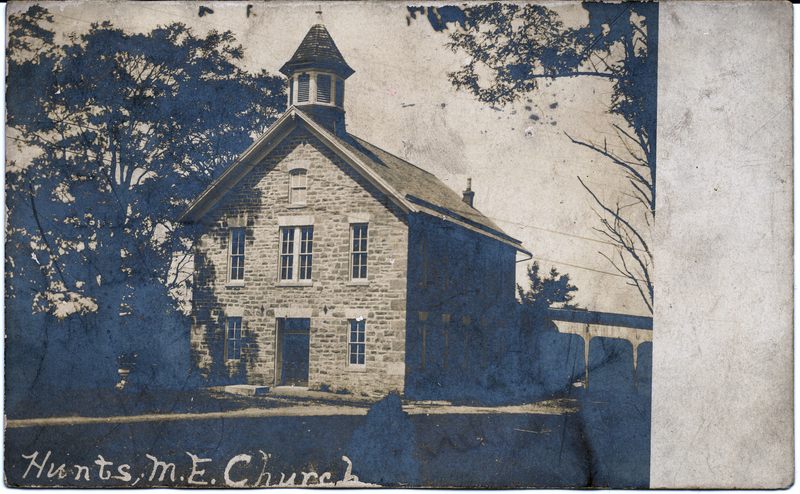 A Miss Clara Miller mailed this real photo post card (RPPC) of Hunt’s Methodist Church in the Green Spring Valley area of Baltimore County to a Miss Clara Chew, Brunswick, Md. in December 1908. According to the church’s historical sketch, a group of Methodists began meeting at the home of Phineas Hunt here in 1773. The stone building was erected in 1874 on the site of several previous log meeting houses. The church, located near the junction of Joppa and Old Court roads, is considered to be located in Towson, but the church itself refers to its location as “Riderwood.”The Baltimore County Historical Sociey erected a historical marker to remember this spot as one of the earliest Methodist meeting-places in Maryland. The structure has clearly undergone expansion and renovation since this homemade photograph was taken. According to the Maryland Inventory of Historic Properties, it was rebuilt in 1933 following a 1932 fire.